The Kindle Fire HD is staggering on paper. In person, it's... pleasant. Which would be an equation for disappointment if you forgot for a second just how cheap this thing is. 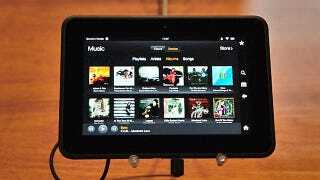 Physically, the Fire HD is awesome. We only got to touch the 7-inch version, but the 8.9-inch is slim and beautiful too. The 7-inch is light, and much nicer to hold than the original Fire. The screen is gorgeous too, with a preposterously wide viewing angle. It's bright and crisp and looks exactly as it should. But. But it's just not nearly as smooth as the Nexus 7 on Jelly Bean. The original Kindle Fire's OS was built on Gingerbread 2.3, and on the Fire HD we get a heavily modified version of 4.0 Ice Cream Sandwich. And after using Jelly Bean on the Nexus 7, it's just impossible to go back to ICS without it feeling horribly slow and laggy. How bad is it? It's bad enough that when you tap an icon, you wonder if you did it wrong, if maybe you didn't tap firmly enough. The bimodal reading, for instance, hung for nearly 10 seconds as it loaded. X-Ray took about five. None had a visual indicator that something was wrong. We're told that we were using production models, so it's pretty disappointing. It's going to ship like this. The one thing we'd say about the OS-level lag is that it's possible that everyone loading up every single app for hands on demos slowed down the device. Amazon is adamant that side-by-side it's going to be just as smooth as Jelly Bean, so we'll see. The original Fire also suffered from a lot of the same lag issues, and ensuing updates made it much more fluid. That's atypical for most Android skins, so there's some precedent to believe that things will improve. The X-Ray for Movies feature is actually really, really cool in person. But there's a sense that it will end up being a lot like the X-Ray, which no one ever actually used. On the plus side, along with the wonderful screen, the speakers really do sound pretty good. Well, they sound at least. We were listening to them in a crowded airport hangar with a bunch of tech bloggers, so we were just sort of impressed they were audible at all. We'll know more once we hear them somewhere quieter, but just being there at all is a big win for watching movies in landscape mode. Bimodal reading—where you listen to an audiobook while the text is highlighted in front of you—is another major plus once it gets going. It's going to be great for kids whose parents are too busy playing with gadgets to read to them, obviously, but it's also just a soothing way to read a book. Be honest: You like when your boyfriend reads to you when you're sick while you eat chicken soup and have the ice bag on your head. This feels like that. Inside of the media apps, things are familiar. The audio and book-reading interface is about the same as you're used to anywhere else, just with Amazon's extra features. But there are so many features now that it feels a little cluttered. The claustrophobia shows up in the books interface, but even more so in movies, where the X-Ray and IMDB logo and everything else just coalesce into a visual mess. It's a shock, coming from the visual fidelity of Jelly Bean or Windows 8. That's not much to balance out the sluggishness, though. And honestly, it would be fine if Amazon could just bludgeon everyone else with price like it did with the original Fire. It can't anymore. Google's Nexus 7 is close enough—even at $250 for 16GB to the Fire's $200—that the value proposition of a tablet with considerable lag isn't worth the couple extra bucks. Compared to a $500 iPad? Sure. But the game's done changed for the little guys. Again, though, this is just the 7-incher. There's still the 8.9-incher to consider. Will the slight upgrade in processor (TI4470 vs TI4460) help with the OS lag? Probably not. But the screen is just as gorgeous as the 7-incher's. It's slim and trim and looks like the perfect tablet if only it were running Jelly Bean. It's not, but there's also no equal-priced alternative that is at its size. 8.9 inches is a wonderful size for a tablet. With a great screen, a great ecosystem from Amazon and Amazon Prime, and great build quality, maybe that's enough to tip the scales back in Amazon's favor.